Biff and WiggleLess Sitting In A Tree – K-I-S-S-I-N-G! So, we were zooming around Twitter last month all happy and waggly when someone named WiggleLess said “Yo Poochy!” and stopped us in our tracks. We were immediately skeptical. WiggleLess? Were they some sort of nefarious anti-wiggle organization? Why would anyone not want to wiggle? After chatting a bit, we were immediately put at ease and knew we’d just made a new friend. So…who is WiggleLess you may ask? 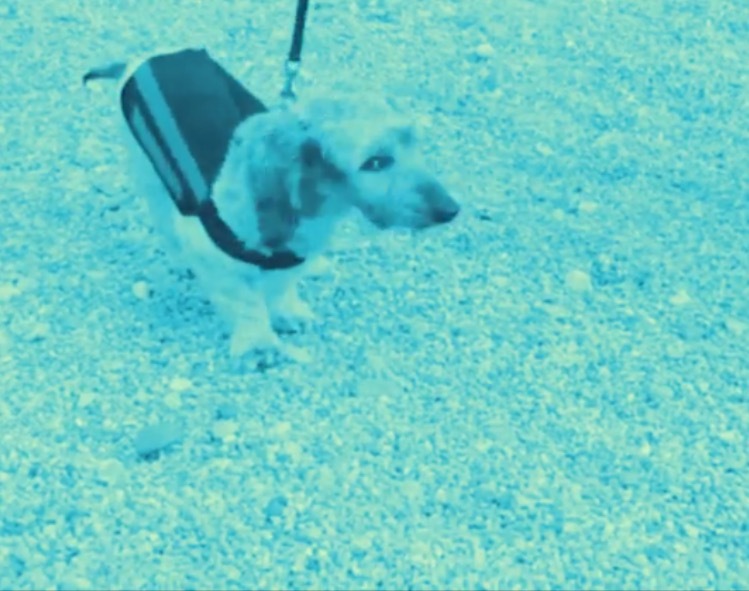 WiggleLess, makes comfortable and effective back-support for dogs! Their back braces are great for dogs prone to back injury or dogs needing activity restriction to prevent further exacerbation of existing spinal or back conditions. And, if that weren’t cool enough – they are pretty sporty looking – for the fashion conscious hound. We immediately thought of our pals over at Animal House Rescue & Grooming! Funded entirely by private contributions, Animal House’s mission is to decrease the euthanasia rate of adoptable dogs by giving them the time to find their forever homes. In short, like Poochy Doos, Animal House knows all the best dogs in town! For us, it was the work of an instant to connect WiggleLess with Animal House. As it turned out, Animal House veterinarian Talia Agone had a very handsome little guy named “Biff” in mind, who she thought could benefit from a WiggleLess back brace. Biff is an adorable 2-year old long-haired Dachshund mix who came to Animal House from a shelter in Kansas where he was rescued as a stray. After jumping off of a grooming table at his previous shelter, Biff’s femur was fractured and later repaired. After coming to Animal house it was evident that the surgery was unsuccessful and in April, Biff had to have his left hind leg amputated. 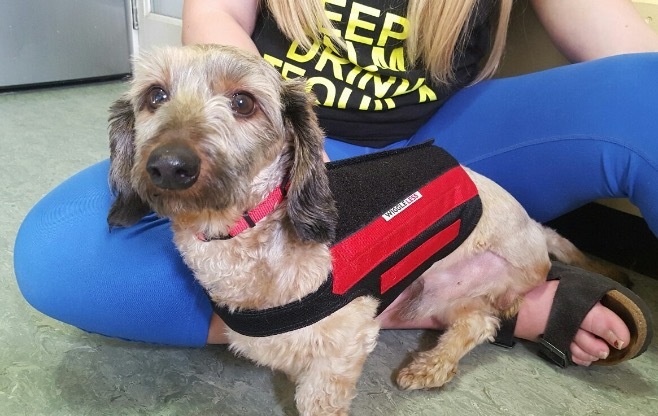 After hearing about Biff – WiggleLess donated a back brace and made sure that little Mr. Biff would be properly fit, by using their handy measurement guide. In just a week’s time, Biff was sporting his handsome new gear and zooming around, quite happy with the added support. In the meantime, Biff continues to be a very amiable little guy. He has adjusted very nicely to his amputation and although he tires more easily than his four-legged buddies, he is young, healthy and hilarious! Like most tri-pawd dogs he is not bothered in the least by having three legs instead of four and is very happy-go-lucky. In fact, he is spreading happiness everywhere. Everyone has fallen in love with Biff and of course – he doesn’t know what all the fuss is about. Despite his three paws – he’s always got his waggle on! Interested in adopting Biff? Please contact Animal House Rescue at: (970) 224-3647. Need professional pet sitting or dog walking for your dog? Please contact us with questions – we’re here to help!